Iron Maiden is back and stronger than ever. With the return of Bruce Dickinson the band is launching the best CD of their careers, Brave New World. 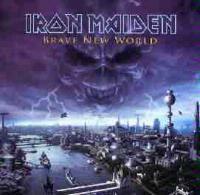 With strong vocals and blazing guitars, Brave New World proves to be metal at its finest. Look for Eddie and the boys this summer on tour. Maiden is helping pave the way for great metal and its return to the mainstream! This album is going to rock you live, go check them out! The first single, this one kicks off with the metal guitar screaming. Bruce has never sounded better and the band is tighter than ever. Very much like the older Maiden material, this one is back to basics. The title track, this one starts off a bit slower but kicks into over drive! An awesome number featuring killer arrangements, this is a peice that is a departure from the traditional Maiden sound but rocks nonetheless. With a gigantic hook and slamming drums, the Mercenary is sure to be a fan favorite. A psychedelically influenced cut, this one slows down the album but only to have you wanting more. I love the lyrics. This is true Maiden style! With a long instrumental intro, this one features some of Bruce's awesome operatic vocals. My personal favorite on the album, everything is perfect on this one! The guitar solo is the beginning is killer. The vocals are clear and strong and the music of the track blows me away. The drums feature some wonderfully chaotic beats. Another favorite of mine, I guess they saved the best for last. Maiden have out done themselves this time.